Baked apples are like an apple crisp contained in a reasonable on serving size vessel. Because if you're like me...one spoonful of apple crisp leads to 10 and then 20...and then I've eaten half of it before I even realized. I used Rome apples for these which are a great baking apple and I also enjoy eating them fresh. They never get enough love because they don't store that well. But fresh Rome apples are in my top 3 favorite apples. Use a heavy duty melon baller or paring knife to hollow out the apples. In a bowl add oats, flour, brown sugar, and cold butter cut into cubes. With your hands work butter into the oats/flour/sugar until there are just small crumbles of butter. If you want drizzle a little bit of honey into the bottom of the hollow apple. Stuff with oat/butter mixture. 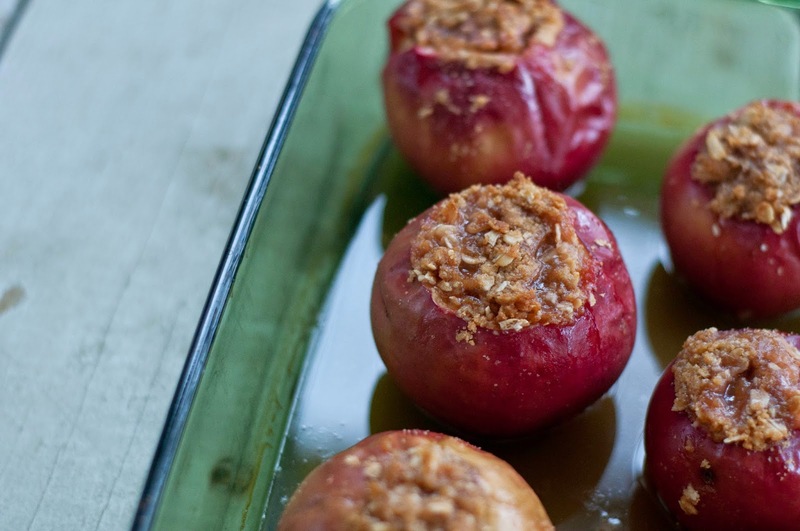 Place stuffed apples into a baking dish. Pour in enough apple cider to cover the bottom of the dish. Bake at 400 for 40 minutes.